Lent is here and although my Catholic happenings only extend to Christmas and Easter mass with my family, I still like to partake in the preparation seasons of Advent and Lent. My whole life was consumed with Catholic traditions so it’s kind of hard to walk completely away from it all together. At times I feel like it’s calling me back… I guess it is part of my identity. There were certain choices I made based on the fact that I was Catholic… am Catholic… I embrace this tug back to the religion only because there is better understanding of it all. My break from the religion allowed me to experience the far bigger, deeper relationship with God that I could have without any restrains. I let go of the idea that the only way I could connect to God was through an institution or a person. I learned to speak from my heart, instead of reciting memorized prayers that had no meaning to me. I also came to realize my spiritual gift of prophecy. Others outside the catholic faith that had this gift appeared in my life and I was not scared of the visions, dreams anymore, (I mean there are some that wake me up at night.) I now understand it is His leading to pursue the light and bring others to the light. My need to be perfect has disappeared. I had spent the majority of my life so careful not to look bad. I needed to be just right. I had such high expectations of myself, not that I blame Cathoclism but that feeling of shame after Confession did not make it any better. Now, I have not altogether joined a Catholic church or anything but I do feel like it’s happening.. maybe for the preparation for a family, a marriage… or simply a need for a foundation. So, my aunt asked me why do we get ashes. A test, I know, “a remembrance of Christ’s death.” So I must remember that: I, me is not the focus. There is an urgency to commit entirely to Him. He has called me to do something that I was created to do. I mustn’t compare, or be jealous of others’ successes when those “successes” were not made for me. I must remember the calling that was I destined to serve. I must listen to know what steps to take. I must remember to stay at peace and be gentle in my words and in my actions. I must remember to have humilty and pray earnestly to uphold humility. To let go of any entitlement, self-righteous mindset because it blocks me from hearing you, Lord. My greatest plea in this season: help me to love, Lord. To love those that have hurt me directly and those I see hurting others. Help me to love and start anew, forgiving all transgressions… everyone is a clean slate. “I still love you.” Help me to love. In my written correspondences with people I have noticed I can not end without “Love.” Love Period. Maybe it’s a reminder to myself …or maybe it’s a deep love I feel for the person I communicating with. I dunno. I have decided to love maybe a year ago. I am not sure how it came about but I started to have this overwhelming sense of love for others. I think The Surrender has a lot to do with it. Believe me it was hard to write this word to certain people because I did not want to scare them away. To even say the word seemed far-fetched. The love word had only resided within my family, where it felt comfortable and did not cause uneasiness. I did not have to explain. To speak the word to others outside of my family was a little too much. “U good?” became my love word. U good was simple and pretty much the love word. As to say, I am concerned about you because I love you= U good? Yet, the process has brought on a need to speak, write the word. As Stevie Wonder reminds is, ” Love is in need of love today.” A call to speak, write, and embrace love. In this Lenten season, teach me how to love, God. Live and work without pride. Be gentle and kind. Do not be hard on others. Let love keep you from doing that. Work hard to live together as one by the help of the Holy Spirit. Then there will be peace. Near the end of last year I had a bit of fear within me. This fear stemmed from being led to do some crazy things. I was led to travel with very little money and meet with professionals in the entertainment industry. I was scared. Is this going to work out? Can I be on my own again? When I arrived to the new city, it was as if angels guided my every step. I was aquainted with helpful people and had this overwhelming peace within me. I was okay. I had a scheduled meeting at 11am but made it to the office around 9:30am, which proved to be good timing because I was able sign contracts, then head to hair and make-up for a photoshoot, and made it just in time to catch my flight back home to Houston. The short trip seemed so surreal because everything was just right…I mean even the weather was perfect. I didn’t even have to fill up the tank of the rental car I used, it stayed on full. It was all so weird how it all worked out perfectly and I simply went by divine instruction… no questions asked. I recently watched the movie The Song of Bernadette. I am not sure why I chose to dvr the movie.. maybe I was led to do so. I watched the film a week or so after the trip and I sensed that there was this push towards “crazy”. 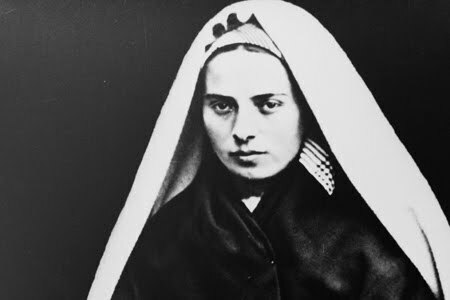 St. Bernadette was not the best student at her catholic school and her family was very poor, so she was not the perfect candidate to be on any platform… until one day while she was gathering bushels as she always did, a vision of Mary appears to her in the grotto. She kneels down to her presence and heeds to the request of coming to this same site for a number of days to recieve divine messages. She has told only her family but then word spreads throughout the city that she has seen a vision of Mary. Some think she is crazy, while others are drawn to go with her to the sacred grotto. In time, she is questioned by city officials and even tested by doctors for insanity, yet the clergy stands behind Bernadette. She follows through with coming to the sacred spot for a number of days as the vision requested and each time she is accompanied by more and more people. People start to believe. However, on one occasion Mary tells Bernadette to drink from the spring and wash her face with the water. She begins to look around but there was no spring for her to drink from. Mary then leads her to a certain spot and tells her dig. Bernadette digs and muddy water appears. She begins to drink and wash her face with the muddy water. This was not a clear water spring… she was washing her face with dirt… she only did what the vision of Mary told her to do. The huge crowd walked away, thinking she was crazy and her own mother carried her away. Yet, later on that day water began to flow from the hole she dug and it eventually became a waterfall. A waterfall with healing power. After seeing the movie, I had decided to make St. Bernadette my patron saint. I admire her strength to follow through. She didn’t care what people thought of her, she only cared about what God thought of her. Even when she was given the message to do something crazy, she had the faith that she would be well taken care of. In fact, when she followed through with Mary’s request, her family was also well taken care of. And in all the questioning and accusations, she held her ground and was then put on a platform to bring people back to Christ. The movie definitely confirmed my recent actions. It was crazy to travel like that, I mean I didn’t even want to tell my parents because it sounded so crazy to do this right now, but I had a knowing that God was with me on this. I think I am called to do some crazy things right now and maybe it’s all part of the testing. I know His life, what He can do, and have taken what was blocking me from Him, now I must utilize all that have learned thus far and go at it… even when it doesn’t make any sense.